Frio County (1,134 sq miles) forms a portion of the northern extent of the Eagle Ford Shale oil window. The Eagle Ford Shale in Frio County is thus prospective more so for oil rather than natural gas. The formation is found at depths of less than 4,000 ft in in the north and as deep as 8,000 ft in the south were activity is concentrated. Eagle Ford Shale drilling is more active in neighboring Atascosa, Dimmit, La Salle, McMullen, and Zavala counties. 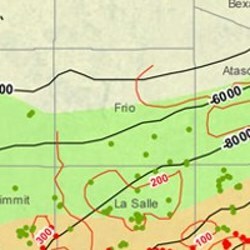 Other productive formations within the county include the Austin Chalk, Buda, Eagle Ford, and Olmos formations. County services of interest to oil and gas lease owners include the Frio County Appraisal District (tax collector) office and the Frio County Clerk (property records) office. The county seat is the town of Pearsall. Other towns in Frio County include Bigfoot, Dilley, Frio Town, Hilltop, Moore, North Pearsall, and West Pearsall. Join the Frio County Discussion Group today - your voice counts! Blackbrush Oil & Gas, Cabot Oil & Gas, and US Enercorp are the most active producers with operations in Frio County, TX.